Last chance for pie drive orders! 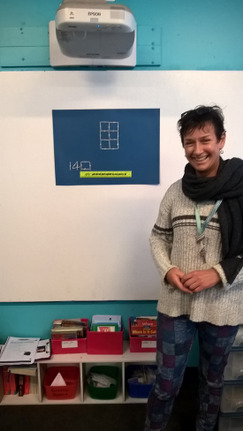 The great work in numeracy continues with Stephanie van der Schans being selected as one of the finalists in the Together We Inspire Awards for being a Numeracy champion. To be selected as a finalist in the Together We Inspire Awards means she has made an exceptional contribution within Numeracy whilst reflecting the Department’s core values and goals. 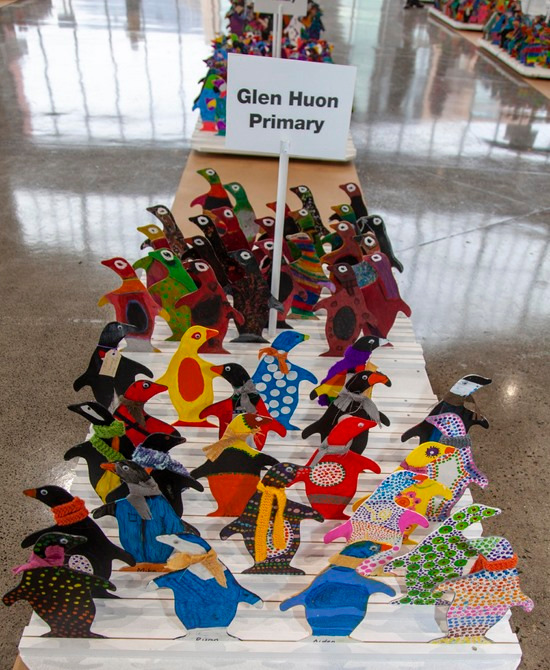 Our work at Glen Huon Primary is being recognised both State-wide and Nationally. 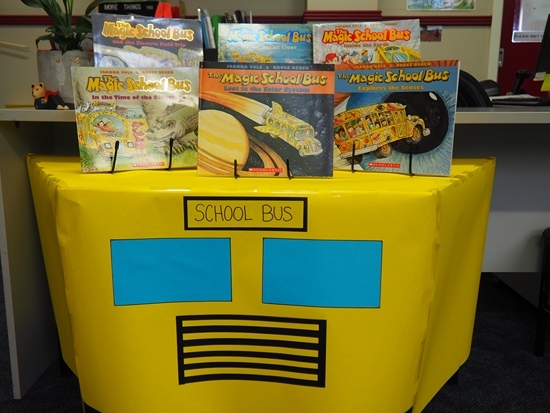 I am looking forward to Thursday and the up and coming Book Week parade. There are lots of lovely displays around the school. 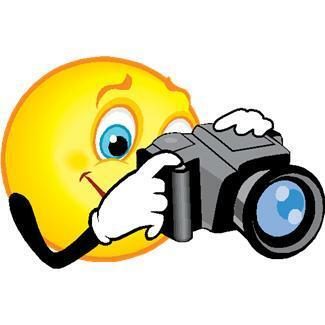 Please don't forget to return you permission forms by this coming Friday. 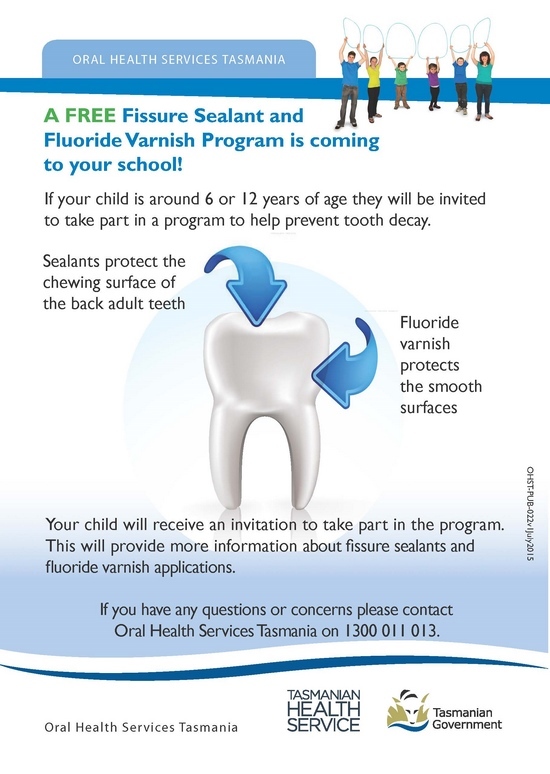 We are very lucky to be one of the schools chosen for this dental program. On Wednesday 15th August I was invited to showcase Maths inquiries enjoyed by and providing challenge to our students and teachers alike. The audience thoroughly enjoyed the slides of our learners deep in thought, working to build on each other’s ideas, using lateral thinking and convincing others of their solutions. 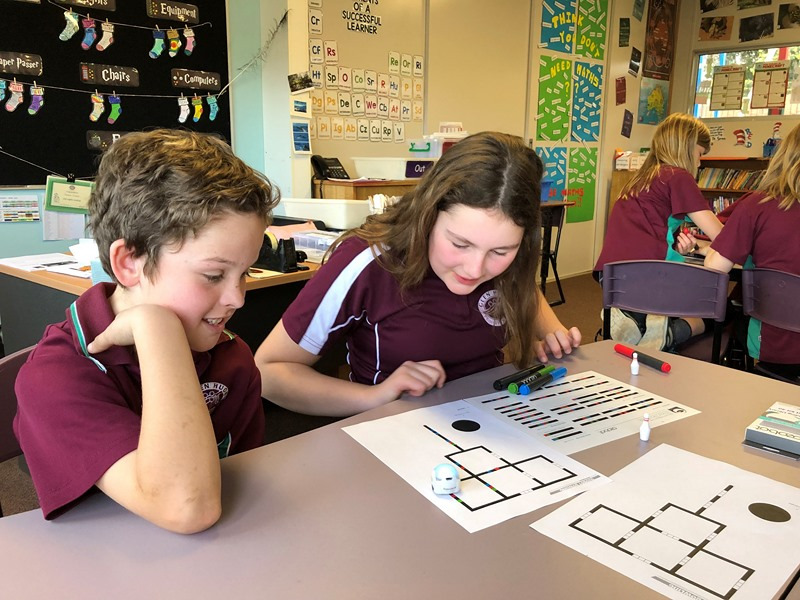 Additions to the ‘reSolve – Mathematics by Inquiry’ lessons were highlighted and noted by task authors as valuable contributions to this dynamic resource. I look forward to continuing to support GHPS teachers to build capacity in inquiry techniques and inspiring our tenacious and creative students. Luca, James, Kiera and Willow have joined our extra Friday afternoon session. Our mission: To find the biggest triangle. Taking in turns to ‘Convince Me’ as they worked like Mathematicians building on each other’s discoveries. See your teacher if you would like to be part of the Mathematical journey. The Smarties letter of the week is Vv, for van, vest, vase and vulture. On Wednesday (9-11 in Kinder) we will be learning all about vegetables - we'll do stamping with veggies and make yummy vegetable fritters! 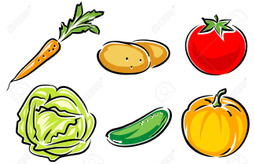 On Thursday (9-11 in the Bush Playground) we'll be roasting apples, building with sticks and logs, and searching for minibeasts with magnifying glasses - don't forget your gumboots! 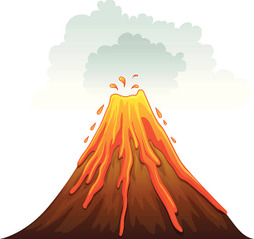 On Friday (9-11 in the Hall) we'll play with the parachute, have a go on a violin, make a volcano erupt and create volcano collages to take home. 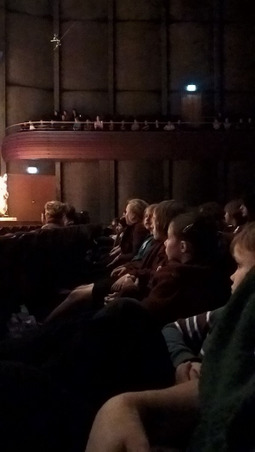 Grade Three/Four, along with Grades Four/Five and Five/Six, recently saw a performance by the Tasmanian Symphony Orchestra. We travelled to Hobart to see them at the Federation Concert Hall near the Grand Chancellor. The TSO performed many musical items along with some of the music from Peter and the Wolf. It was a fantastic outing and we even saw Sammy the seal at the wharf. He was eating fish scraps which had been thrown to him. Then we went to Sandy Bay to have lunch and play in the park. It was a long day but well worth the long bus ride to Hobart. Don't forget to get your pie orders in by this Thursday, 23rd August! 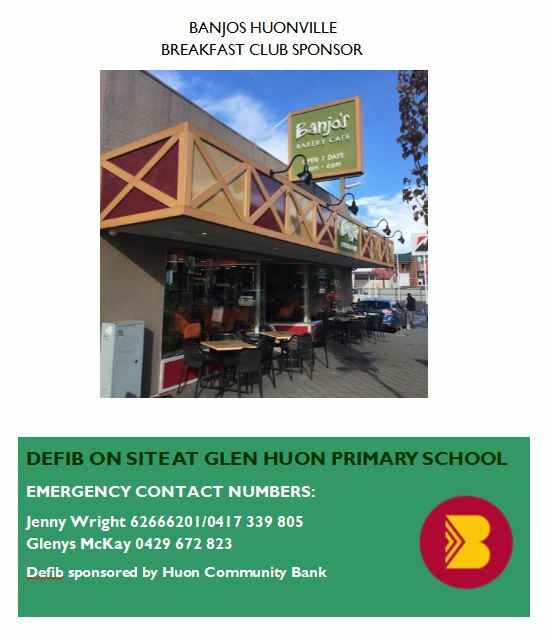 Enjoy some delicious, fresh pies and help to raise funds for the school at the same time. Orders can be dropped in at the school office. Grade 5/6 has begun a waste audit on our school. So far we have been amazed at the food being thrown out across all classes. Stay tuned for more photos and our collection of data. Monday’s Making Mathematics Team were faced with a catering problem. Thirsty work on a cold winter’s day. Every year the Grade sixes from Glen Huon Primary School like to go an Outdoor Education camp. During the week-long trip, the students study nature and participate in recreational activities. Everyone pitches in to help with the cooking and clean-up. campers. They make the juice by mixing water and orange juice concentrate. To find the mix that tastes best, Freya and Kai decided to test some recipes on a few of their friends. 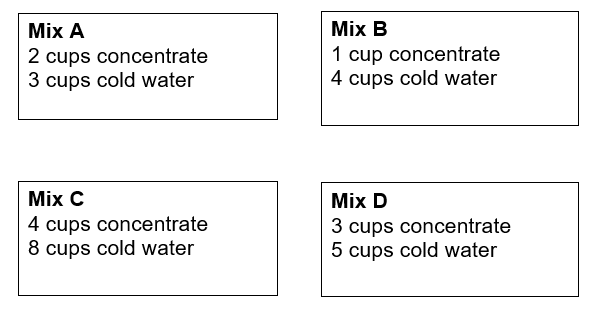 They tested four juice mixes. Which recipe will make the juice that is most “orangey”? Assume we had a huge number of visitors join us. So that 240 campers now receive half a cup of juice each. For each recipe, how much concentrate and how much water will be needed to make juice for all 240 campers? Don’t forget to explain your answer. 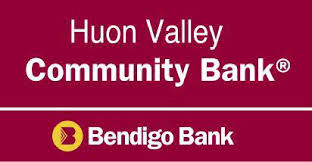 Huon Valley Council are hosting a community information session called Understanding and Supporting Mental Health. This is a joint presentation between SPEAK UP! Stay ChatTY and headspace Hobart. Mitch McPherson will share his personal story and talk sensitively about the impact suicide has on families and the community. Headspace will describe how best to support young people’s mental health. We will have some local services on hand after the talk. The session is not suitable for children under 14 years. If you have any queries, please do not hesitate to contact the Health and Wellbeing Team on 6264 0300.